A must for transportation in nursing, homes, offices, hospitals, mail rooms, etc. A versatile piece of equipment. Rolls where you need it. Top basket has built-in hanging file frame that holds standard legal size hanging folders. Roomy bottom basket holds bulky packages or not-yet field paperwork. 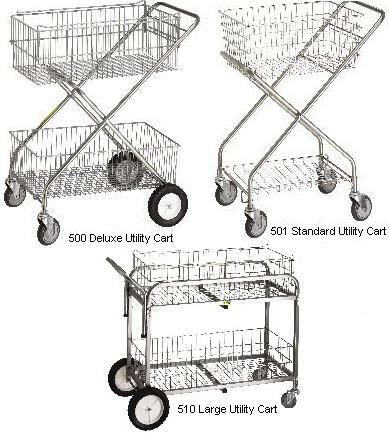 Cart built with 1/8â€� steel tubing, chrome plated with gray copolymer coated baskets. Oversize 8â€� wheels on back 5â€� swivel casters on front. Weight capacity is 25 lbs per basket. Overall is 37-1/2â€�. All purpose chrome cart is ideal for pick up and distribution of supplies, mail, parts, tools, disposables, etc. Folds for easy storage with removable wire constructed top basket. Bottom shelf accommodates bulkier items. Cart built with 1/8â€� round steel tubing. Weight capacity is 25 lbs per basket. Overall is 36â€�. A real workhorse. Combines carrying capacity with space saving storage when not in use. Built with 1â€� square heavy-gauge steel tubing with heavy-duty 5â€� swivel casters in front and 10â€� wheels in back. Top basket is chrome plated, comes with a legal file folder rack. Bottom basket accommodates bulkier items. Weight capacity is 50 lbs per basket. Overall height is 40-1/2â€�.